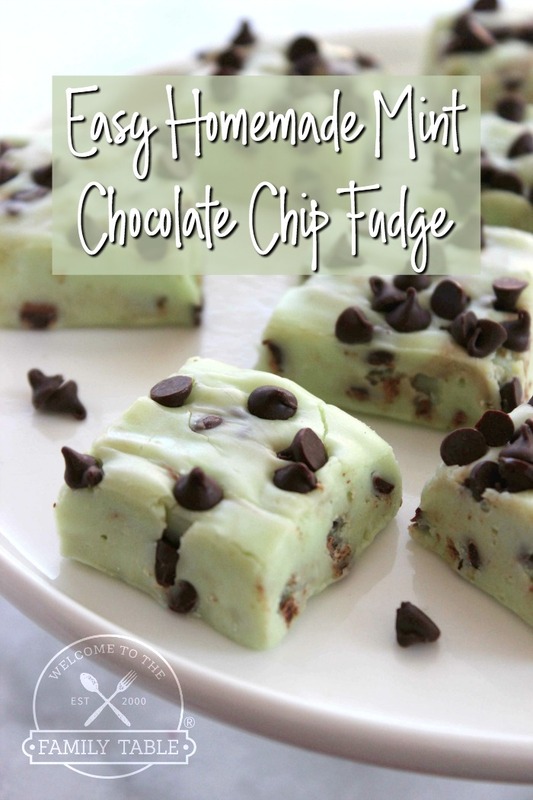 Easy homemade mint chocolate chip fudge? Yes, please! I’ve been a lover of mint and chocolate ever since I can remember. I will never forget the first time I had a mint chocolate chip ice cream cone with my precious Grandma Jean at Baskin Robbins – it was love at first bite! I am excited to share with you a delicious recipe of one of my all-time favorite flavor combinations: chocolate and mint. I hope you enjoy this easy homemade mint chocolate chip fudge recipe as much as my family does! Line 8×8 pan with foil and spray with non-stick spray. Melt white chips and shortening by microwaving for 45 seconds, stirring and repeating until melted and smooth. Add sweetened condensed milk and mint to melted chocolate and stir to incorporate. Add food coloring to reach desired color. Allow mixture to cool a little before adding mini chips or they will melt. Fold in mini chips, reserving about 1/4 to place on top. Transfer to prepared pan and press into place. Sprinkle top with reserved chips and refrigerate for at least 1 hour before cutting. Line 8x8 pan with foil and spray with non-stick spray. Looking for some more desserts to soothe your sweet tooth? Check out other fabulous desserts here. Yummy! Big mint fan here, but never tried it in fudge. Nice addition to Christmas candies, too. Thank you!